Water Jet is finally available! 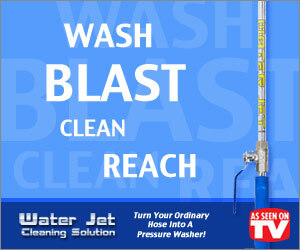 As Seen on TV, it helps remove built-up dirt and mold on wood or aluminum siding and concrete foundations. It easily washes your car, truck, camper or boat and tackles dirty wheels and rims. It can also blast away weeds and grime from bricks and concrete patios, pool decks, and driveway. It safely reaches up to 2nd story windows and removes wasp nests from a safe distance. Order it today and get a water jet brass fan tip for FREE. Sop ‘N Mop – Better Than Shamwow!